This uptime guarantee applies to any client that has exchanged currency for services within the last 30 days and is in good financial standing with EntrustedMail at the time of a service outage. Network downtime (unavailability) is defined as 100% packet loss from EntrustedMail to its backbone providers. Downtime is measured after client notifies EntrustedMail of a network failure by phoning into EntrustedMail directly and after EntrustedMail administrators have confirmed the outage by a trace-route to the customer's MTA from outside the EntrustedMail network. Customers may be entitled to credits as calculated below and as measured 24-hours a day in a calendar year, with the maximum credit not to exceed fifty (50) percent of the annual service charge for encrypted e-mail client licenses Fees for Secure E-mail Portals, Setup Services, Custom URLs or any other service item are NOT credited by this Service Level Agreement. Minutes of Continuous Downtime: 60 minutes or more. In order for you to receive a credit on your account, you must request such credit within seven (7) days after you experienced the down time. You must request credit by mailing a request to FiLink Corporation, Attn: Billing, 1173 Concord Rd SE, Smyrna GA. Credits will usually be applied within sixty (60) days of your credit request. Credit to your account shall be your sole and exclusive remedy in the event of an outage. Customer shall not receive any credits under this SLA in connection with any failure or deficiency of website availability caused by or associated with circumstances beyond Entrustedmails reasonable control, including, without limitation, acts of any governmental body, war, acts of terrorism, insurrection, sabotage, armed conflict, embargo, fire, flood, strike or other labor disturbance, interruption of or delay in transportation, unavailability of or interruption or delay in telecommunications or third party services, virus attacks or hackers, failure of third party software or inability to obtain raw materials, supplies, or power used in or equipment needed for provision of this SLA.Failure of bandwidth providers to the Entrustedmails Network, unless such failure is caused solely by Entrustedmail. Scheduled maintenance and emergency maintenance and upgrades.DNS issues outside the direct control of Entrustedmails . False SLA breaches reported as a result of outages or errors of any report system. Customer's acts or omissions (or acts or omissions of others engaged or authorized by customer), including, without limitation, custom scripting or coding (e.g., CGI, Perl, HTML, ASP, etc), any negligence, willful misconduct, abuse of the Services in breach of Entrustedmails Client Responsibilities (acceptable use policy) posted on the Entrustedmail's website.E-mail or delivery and transmission not related to a network outage.DNS (Domain Name Server) Propagation.Outages elsewhere on the Internet that hinder access to our network. 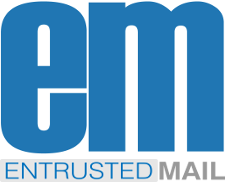 Entrustedmail will guarantee only those areas considered under the control of Entrustedmail. E-mail sent by non-licensed e-mail addresses is not covered by our SLA. Entrustedmail system of monitoring shall be the exclusive monitoring system used to verify SLA breaches or downtime. No third party monitoring system will be recognized. Client acknowledges and agrees to be bound by all the terms, conditions, and policies, as set forth herein, including any future amendments. Client acknowledges and agrees that it is responsible for continual compliance of this policy.Client may not send, or attempt to send, unsolicited email messages ("Spam"). Spam violates many federal and state laws and seriously affects the efficiency and of Email Services. Sending Spam can lead to industry blacklisting of mail servers, resulting in interruption and/or termination of E-mail Services. Send or attempt to send unsolicited bulk or commercial messages ("spam"). This includes, but is not limited to, bulk mailing of commercial advertising, informational announcements, charity requests, petitions for signatures, and political or religious tracts. Such messages may only be sent to those who have explicitly requested it from your domain.Send, or attempt to send, Spam of any kind from third-party networks using a return email address that will cause mail flow through the Entrusted Mail Network, or referencing an email address hosted on the Entrusted Mail Network.Send, or attempt to send, numerous copies of the same or substantially similar message with the intent to disrupt a server or account ("mail bombing").Send, or attempt to send, e-mail messages used to harass or intimidate others. Harassment, whether through language, frequency of messages, or size of messages, is prohibited.Continue to send email to a recipient that has indicated that he/she does not wish to receive it.Take any actions intended to cloak the Client's identity or contact information, including but not limited to intentionally omitting, deleting, forging or misrepresenting message headers or return addresses.Send mail from domains that are not listed in the deployment questionnaire and/or that have not been requested.Send mail by an automated means, such as a computer program, that sends more than 250 messages per a 24 hour period of time. Such delivery methods require a "machine license".In the absence of positive, verifiable proof to the contrary, Entrustedmail considers complaints by recipients of emails to be de-facto proof that the recipient did not subscribe or otherwise request the email(s) about which a complaint was generated. 2.2 SENDING "OPT-IN" BULK EMAIL (Permission based). Client may not use the EntrustedMail Services to send "Opt-in" Bulk Email. We define "Opt-in" Bulk Email ("Bulk Email") as email messages of similar content that are sent to more than 250 recipients within a relatively short period of time. The term "Opt-in" means that the recipients have signed up to receive the emails voluntarily, and implies that the Bulk Email is not Spam. Entrustedmail has measures in place to prevent Bulk Email from being sent through its servers, and any attempt to do so may result in interruption and/or termination of Client's Email Services. Attempts to circumvent this Bulk Email restriction by breaking up bulk mailings over a period of time or by sending from multiple email accounts will itself be considered a violation of this policy.Additionally, the Client may not send Bulk Email from third-party networks using a return address that is hosted on the Service Provider Network, unless Client takes extreme care to prevent more than 100 bounce emails from arriving to the Service Provider Network as the result of sending Bulk Email from a third-party network. Client is prohibited from violating, or attempting to violate, the security of the EntrustedMail Network. Entrustedmail will investigate any alleged violations. Examples of violations of the security of the Entrusted Mail Network include, but are not limited to:accessing data not intended for Client.Logging into a server or account which the Client is not authorized to access. Attempting to probe, scan or test the vulnerability of a system.Breach of security or authentication measures. Attempting to interfere with service to any user, host or network. Email Services may only be used for lawful purposes. For example, Client may not use the EntrustedMail Network to transmit or distribute content that:violates a trademark, copyright, trade secret or other intellectual property rights of others.violates export control laws or regulations,violates the privacy, publicity or other personal rights of others,impairs the privacy of communications,contains unlawful, defamatory, harassing, or fraudulent content,encourages conduct that would constitute a criminal offense or give rise to civil liability,violates reasonable regulations of Entrustedmail or other service providers,causes technical disturbances to the EntrustedMail Network, its partner networks or the network used by Client to access the Email Services, or violate the policies of such networks, including, but not limited to, intentional introduction of any viruses, Trojan horses, worms, time bombs, cancel bots or other computer programming routines that are intended to damage, detrimentally interfere with, surreptitiously intercept or expropriate any system or data, or assists, encourages or permits any persons in engaging in any of the activities described in this section.If Client becomes aware of any such activities, Client is obligated to immediately notify Entrustedmail and take all other appropriate actions to cause such activities to cease. Client is responsible for all content that is transmitted and received though the EntrustedMail Network. Service Provider takes no responsibility for content passing through or stored on the EntrustedMail Network, including but not limited to, viruses, mail floods or other disabling features, or content provided on third party websites that are linked to by content passing through or stored on the EntrustedMail Network. Entrustedmail reserves the right to suspend or terminate Client's access to Email Services upon notice of a violation of this policy. Indirect or attempted violations of this policy, and actual or attempted violations by a third party on behalf of Client, shall be considered violations of this policy by Client. Maximum Messages Per Connection: 200 (messages in outbox). Maximum Message Size: 52 GB. Invalid Recipients: 25 Per Hour (number of invalid recipient address processed per hour).